Nexus Minerals $NXM has identified an extensive gold/arsenic soil anomaly covering 1.6km x 300m at the Pinnacles JV. The anomaly is located 400m to the northwest of the Pinnacles resource area. Geophysical processing is underway before further drilling is planned. Follow-up RAB drilling identified several mineralized intersections including 3m@1.13g/t Au / 1100ppm As from 35-38m (end of hole). Eastern Goldfields gold explorer, Nexus Minerals Limited (ASX: NXM) (Nexus or the Company) is pleased to announce that it has identified a 1.6km x 300m geochemical coincident gold (>15ppb) arsenic (>50ppm) anomaly on the Pinnacles JV Gold Project (Fig. 1). Research of Department of Mines and Petroleum database reveals work by previous operator (Troy Resources 1994 (Troy)) identified five coincident gold arsenic soil geochemical anomalies. Troy undertook a soil auger program on a 200m x 50m spaced grid using a truck mounted rig with all samples collected at a depth of 1m. A total of 853 soil samples were collected in 1993 and analysed for gold and arsenic. Maximum values of 280ppb Au and 450ppm As were recorded. The largest anomaly, Pinnacles North, covers an area of 1.6km x 300m. Two of the anomalies were associated with exposed areas of mineralisation being Pinnacles East (covering the Resource area currently being assessed/drilled by Nexus, and Pinnacles West (drilled by previous operators). Anomalies four and five are located in the very northern part of the tenement and are based on a limited number of anomalous data points. 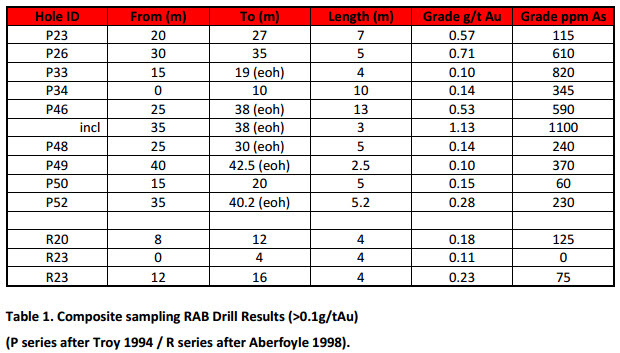 A total of 70 shallow RAB holes were drilled in 1994 (Troy) and a further 30 shallow RAB holes by Aberfoyle Resources Limited (Aberfoyle) in 1998, testing the five soil anomalies. Pinnacles East anomaly is located over the resource area currently being assessed by Nexus and is well documented in company releases. Pinnacles West anomaly is the most dominant feature in the district and is exposed as a topographic high. The size of the soil anomaly is exaggerated because of “shedding” of the main ridge mineralized zone over the surrounding lower landform. The area has been drilled by previous operators with some forty RC drill holes drilled under the exposed ridge. This area will be fully assessed by Nexus in conjunction with its regional exploration program. The two anomalies located in the very northern part of the tenement are based on a limited number of anomalous data points and are on the JV tenement boundary. Nexus’ regional tenement abuts this tenement and the area will be fully assessed by Nexus in conjunction with its regional exploration program. Troy undertook the drilling of 30 shallow RAB holes (in 1994) into the southern part of the Pinnacles North anomaly which resulted in several anomalous intersections. The northern part of this anomaly was tested by Aberfoyle (in 1998) with the drilling of 6 shallow RAB holes. This program also resulted in anomalous intersections (Table 1 and Fig. 2). The anomalous intersections identified in these programs have never been followed up with further work. Nexus is continuing to build up geological, structural and mineralisation information of the region to allow for targeted drill programs to be designed. Southern Geoscience Consultants have been engaged to reprocess and integrate previous multiple aeromagnetic survey data, recorded by government and public companies – now available on open file (Fig 3). This will be aided by the geological knowledge gained by Nexus field mapping of the tenement. In addition to this a ground IP geophysical survey is planned to be undertaken in the June quarter. The program will initially cover the Pinnacles resource area, to provide the operator with a base response, with the survey then being extended to the north to cover the larger 1.6km x 300m soil anomaly, and to the south to gain geological information under the extensive alluvial flats. In the northern part of the tenement, north of the Pinnacles North soil anomaly, the lateritic cover profile increases significantly to >10m, making the soil sampling program in this area ineffective. This type of lateritic cover is responsive to the LAG sampling technique – which involves the sampling of the surface veneer of ferruginous saprolite and/or lateritic nodules. It is a method used extensively for the detection of gold deposits in this type of terrain, whilst assisting in the understanding of the underlying regolith. A LAG sampling program is currently being developed. Following the integration of all geological/geophysical/structural/geochemical inputs detailed above, drill programs will be designed to test the previously untested anomalous RAB intersections and other prospective areas identified.